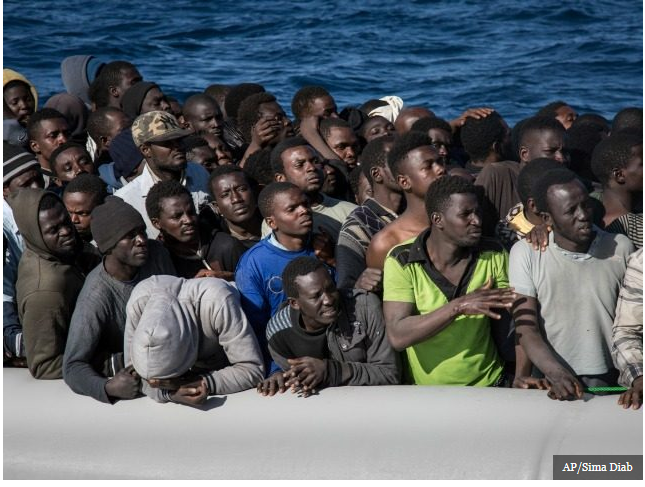 Yesterday Breitbart posted a picture of a group of illegal immigrants headed for Spain. At first glance, these seem to be all young men who should be capable of working to change things in their home countries. They do not look like starving, desperate immigrants. The recent installation of a new Socialist government, which has made a show of being in favour of more open borders at a time when Italy’s new populist coalition is cracking down on illegal sea crossings, appears to have left them having to cope with an increased number of migrants as well as conventional criminals. European security services are concerned that travel of this kind could be used to execute a deadly terror attack, with armed jihadists landing on a beach like the one at Zahora and opening fire on sunbathers in a seaborne version of the Tunisia attack which left 38 mostly British tourists dead in 2017. A country without secured borders is not a country. Europe is rapidly learning that lesson the hard way. Hopefully America will learn from their example. Spain went ‘green’ a few years ago. They began heavily subsidizing solar and wind energy projects in the early 2000’s. Last Thursday, the Daily Caller posted an article updating us on the results of this program. This really does not sound like an example we want to follow. Not only did Spain’s green energy program hurt the Spanish economy, it didn’t help with the carbon footprint. The IER study also notes that Spain’s green agenda was not able to keep its carbon footprint from rising. Between 1994 and 2011, Spain’s carbon dioxide emissions grew 34.5 percent, despite the country’s green push which began in the 1990s. “While the renewable policies themselves were likely not the cause of the emissions increase, the upward trend does prove that renewable energy policies were insufficient to reduce CO2 emissions over a roughly twenty-year period,” according to IER. Green energy may eventually provide better ways to fuel the world’s economy, but we are not there yet. We need to allow the free market to determine our steps forward. Government subsidies are obviously not the answer. Haven’t These People Ever Heard Of Motel 6 ? The Daily Caller reported today that Michelle Obama‘s trip to Spain in 2010 cost the American taxpayers an estimated $467,585. Let’s take a minute and talk about some of the places we could easily cut federal spending. I don’t begrudge the First Lady a vacation–she deserves time off. But it does seem a little insensitive that when many Americans are putting aside their vacation plans in a tight economy with rising gasoline costs, Michelle Obama is living like a queen. Fitton’s group has previously disclosed the cost of sending the first family on overseas trips. Its analysis indicated that it cost $424,142 to fly the first family to South Africa and Botswana in 2011. That’s nearly one millions dollars on trips in two years. It seems a little high. I would think that the First Family would be willing to set an example for the rest of the country in cutting back their spending. Speaking about the economy at an event in New Hampshire, Mr Obama told Americans: “When times are tough, you tighten your belts. The President should start listening to his own speeches. Yesterday Investor’s Business Daily reported on a major event at the Colombian summit that seems to have been overlooked in the reporting. Never was a response to a global outrage more mealy-mouthed than the one from the U.S. after Argentina’s President Cristina Fernandez de Kirchner, standing under a portrait of Evita Peron, announced a brazen grab for YPF, the Argentine oil company that’s 57% owned by Spain’s Repsol. Markets fell, world leaders denounced the violation of contracts and economically battered Spain rallied European Union support. But the U.S.? “We are following developments on this issue. We are not currently aware of any WTO complaints related to this issue,” the State Department said. The article points out that Argentina is in financial trouble because of overspending. If Argentina defaults or Spain defaults, the IMF will be called in to do a bailout. That will directly impact the pockets of American taxpayers. Meanwhile, U.S. investors own about 5% of Repsol. Its takeover hurts U.S. investors and our tax base. This should concern the indebted U.S., which if it did what other countries do, would defend its investors. The U.S. buys 29,000 barrels a day from Argentina, a third of its output, and will need to find a new supplier as that collapses. Worse still, Argentina will lose investment in its vast shale reserves, the world’s third-largest at 22%. As that goes, prices will rise. Worst of all, the expropriated assets may now go to China, significantly raising its influence in the region. It sounds as if our State Department was not paying attention to the events around them. Yesterday Investors.com posted an article about a campaign ad the Obama campaign has created. The ad is total fiction, and the article explains why. We need to remember that Spain ended its government sponsored green energy program because for every job they created, two jobs were lost. We need to learn from the Spanish experience. Overall the ad is a very nice-sounding group of lies. I am sure it is the first of many such ads. As voters, we need to learn to fact check all political ads from all candidates. Statistics can be twisted to say anything the person citing them wants them to say. Polls can be skewed according to who is polled. As voters, we really need to pay attention to what is said during the campaign and how much of what is said is actually true. Green energy is a great idea. Unfortunately, we haven’t reached the point where it makes economic sense. I suspect we will get there in the near future, but we are not there yet. When the United States or other governments try to force the issue, they run into problems. (See rightwinggranny.com from March 8, 2011, which explains what has happened with green energy in Spain). Now it’s the Netherlands’ turn. On Wednesday, November 16, Reuters reported that the Dutch government is preparing to end its subsidies of offshore wind power. There are 36 turbines in the North Sea that produce enough electricity to meet the needs of more than 100,000 households each year. Because of the need to cut its budget deficit, the Dutch government says it can no longer afford to subsidize the entire cost of offshore wind power (18 cents per kilowatt hour–4.5 billion euros last year). The government now plans to transfer the financial burden to households and industrial consumers in order to secure the funds for wind power and try to attract private sector investment. It will start billing consumers and companies in January 2013 and simultaneously launch a system under which investors will be able to apply to participate in renewable energy projects. But the new billing system will reap only a third of what was previously available to the industry in subsidies — the government forecasts 1.5 billion euros every year — while the pricing scale of the investment plan makes it more likely that interested parties will choose less expensive technologies than wind. The outlook for Dutch wind projects seems bleak. There will come a day when green energy is practical. Today is not it. When the government interferes with the free market, bad things happen.